NTU's research in electronic textiles is having a significant impact on the health, sports, defence and fashion sectors. Five of the products developed by the research now have worldwide patents, demonstrating evidence of their impact. a new test for a hip protector system. In the past decade there has been a lot of commercial interest in electronically active smart textiles. Business Wire claims that market growth in the sector is estimated at 21.54% annually from 2013 to 2018, and is expected to reach over $2 billion by 2018. As a result of the commercial potential, there is intense worldwide research interest in electronically active textiles, but only a very few research groups specialise in specific technical aspects. The broad scope of NTU's research group and its focus on fusing scientific, engineering and design disciplines to create novel and innovative electronically active smart textiles make their research unique internationally. The smart yarn technology developed by NTU has provided a robust functionality that is resistant to wear, washing and drying and can be produced at lower costs than other electronic textiles where functionality is often added at the garment stage. As a result, NTU's products have a significant impact on the production and use of electronic textiles in clothing applications. Research on knitted transducers exploits the technology in a range of sectors for remote condition monitoring of heart rate, breathing patterns and skin temperature. The devices, developed through the findings of NTU's research, transmit data wirelessly in real-time for analysis. The Ministry of Defence conducted experimental trials on a seamless knitted garment designed and made from electrically conducting yarns by Dias' team, applying the knowledge in patent. The details and the outcome of the trials cannot be disclosed. Professor Dias and his team designed a knitted glove liner with five heating elements and conductive pathways. The team also developed the technology to manufacture the knitted glove liner on a commercial scale. The team is developing further products for the management of Raynaud's disease. NTU's researchers developed a test method for screening the hip protectors. NTU's research in advanced textiles dates back to 1980 and is based on expertise in textile fibre materials, digital textile manufacturing processes and garment making. In 2008, the School of Art & Design recognised the importance of designing electronically active advanced textiles for wearable systems. This led to the research team bringing together expertise in knitting, weaving, embroidery and garment construction to develop textile stretch sensors. The research base was strengthened by the arrival of Professor Dias, who joined in 2010 to lead the Advanced Textiles Research Group (ATRG). Dias has led research to understand the electrical properties of knitted structures when they undergo static and dynamic deformations. The knowledge generated by this research has a practical application in the development fibre-based transducers for wearable computing and in the next generation of SMART clothing. The SMART clothing enables measurement of the vital signs of the body: ECG, breathing rate, breathing patterns, skin temperature, perspiration, bodily electrical activity, body motion and gesturing. The potential of health monitoring clothes to improve the quality of life and health outcomes for patients and the elderly is immense. The demand for the form of transducer developed by Dias and his team arose from the limitations of the first generation of smart clothing, which used rigid sensors bolted on to the garment using traditional textile processes such as sewing and gluing. The fabric transducers developed at NTU incorporate the electro-conductive fibres in the non-conductive base structure during the fabric manufacturing process, which make second- generation smart clothing possible. The team's research identified major challenges in second-generation technologies for smart clothing caused by the inherent hysteresis of textile structures which limits their application to only relative measurements. Truly smart textile structures and clothing must be able to carry out absolute measurements, analyse data and respond accordingly. To address this problem, from 2010 the team began to research the possibility of embedding semiconductor micro devices into fibres and yarns, using a conformable polymer resin to bind the chip with the fibres of the yarn. The objective is to position encapsulated chips along the length of the yarn at predetermined intervals without compromising fabric manufacture. The encapsulation hermitically seals the chip, protecting it from all forms of stress (mechanical, thermal and chemical). This produces intelligent electronic yarn capable of physical sensing, signal processing, transmitting and receiving. 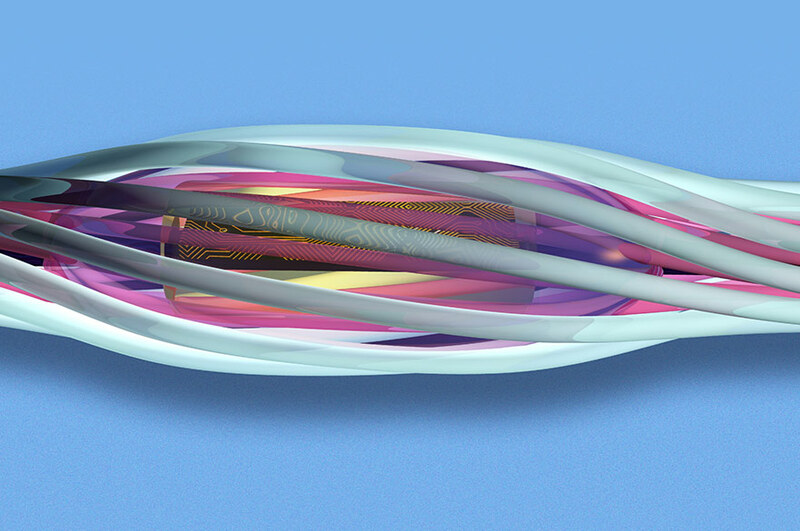 This intelligent yarn will form the basic building blocks of truly flexible, drape-able and washable textile computers in the near future, creating third generation wearable computing. The work in this area has been predominantly led by Professor Tilak Dias, Dr Sarah Kettley, Colin Cork and William Hurley. Kettley, S., Downes, T., Glazzard, M. and Harrigan, K. (2011) Fit for purpose? Pattern cutting and seams in wearables development. Digital Creativity. vol 21. No 4. 247-56. Tennant, A., Hurley, W. and Dias, T. (2012), Experimental knitted, textile frequency selective surfaces, IET Electron. Lett. 48, 1386. Acti, T., Zhang, S., Chauraya, A., Whittow, W., Seager, R., Dias, T. and Vardaxoglou, Y, High performance flexible fabric electronics for megahertz frequency communication, LAPC 2011, Loughborough, IEEE Conference Publications 2011, pp. 1-4. DOI:10.1109/LAPC.2011.6114088. Delkumburewatte, G. B., and Dias, T. (2011) Wearable cooling system to manage heat in protective clothing, The Journal of the Textile Institute, vol. 1. pp.1-7 http://dx.doi.org/10.1080/00405000.2011.587647. Dias, T., and Monaragala, R., Development and Analysis of Novel Electroluminescent Yarns and Fabrics For Localized Automotive Interior Illumination, Textile Research Journal, vol. 82, 2012, pp. 1164 – 1176. DOI: 10.1177/0040517511420763. Professor Tilak Dias (PI, NTU); Professor Yiannis Vardaxoglou (PI at Loughborough University); "High performance flexible, fabric electronics for MegaHertz frequency communication"; collaborative research project with the School of Electronic, Electrical and Systems Engineering at Loughborough University; Project duration: 1 October 2010 – 30 September 2013 (36 months). Professor Glen McHale (Principal Investigator); Professor Tilak Dias (Co-Investigator); "Smart Materials – Designing the functionality"; Project duration: 2 January 2011 – 30 June 2012 (18 months); Funded by EPSRC feasibility study programme. Professor Tilak Dias "The development of clothing with fully embedded electronics for military applications"; Project duration: 1 February 2012 – 31 January 2016 (48 months); Funded by the National PhD Programme, DSTL. Professor Tilak Dias (Principal Investigator at NTU); Dr Alan Tennant (Principal Investigator at University of Sheffield); "Knitted Electromagnetic Functional Textiles for LO Applications"; Collaborative research project with the Department of Electrical and Electronic Engineering at Sheffield University; Project duration: 1 February 2012 - 31 July 2012 (six months); Funded by DSTL. Professor Tilak Dias (Principal Investigator at NTU); Dr Alan Tennant (Principal Investigator at University of Sheffield); "Manufacture of conducting textile electromagnetic structures using flat-bed knitting and laser ablation techniques"; Collaborative research project with the Department of Electrical and Electronic Engineering at Sheffield University; Project duration: 1 September 2012 – 28 February 2013 (six months); Funded by DSTL. Professor Tilak Dias; "Seamless knitted prosthetic sleeves for the management of perspiration"; Project duration: 24 September 2012 – 23 March 2013 (seven months); Funded by DSTL. Professor Tilak Dias (Principal Investigator at NTU); Professor Steve Beeby (Principal Investigator at University of Southampton); " Smart Multifunctional Materials – Advanced Manufacturing of Smart and Intelligent Textiles (SMIT)"; Collaborative research project with the Electronics and Electrical Engineering Group, Electronics and Computer Science of the University of Southampton; Project duration: 1 July 2013 – 31 March 2014 (nine months); Funded by DSTL.